A blog is a type of website or part of a website. Blogs are interactive forms in writing in that they allow users to comment and reply to each other's writing and reflections. Sometimes, they look like a journal where someone writes what they are thinking, only it is on a computer, rather than done with pencil and paper. A blog consists of a post, which can be thought of as a writing prompt or an article or report. The second part of a blog is the comments, which is where others can respond, reflect, or add to the post. The comments should connect to the post; they should go together, even if they are not in agreement. Students will need to practice appropriately commenting to blog posts. They will need practice and models of how to comment on other's post and be reflective and constructive, rather than rude or offensive. It is important for students to learn how to write and respond in such a way that doesn't hurt feelings. This is especially important as we share our beliefs and opinions online. As students begin to respond in blogs stating their stance or opinion, they will need to be able to support their thinking with evidence to support why they feel that way. Students will use critical thinking to support their ideas. This is high powered writing. It is important that students always understand the purpose of their blogging. Blogging is a great fit with all the content you teach. Giving students open ended questions and allowing them to respond and reflect gives them a voice as well as has them think about their learning. Click here to hear from an elementary teacher how she uses blogging successfully with her students. 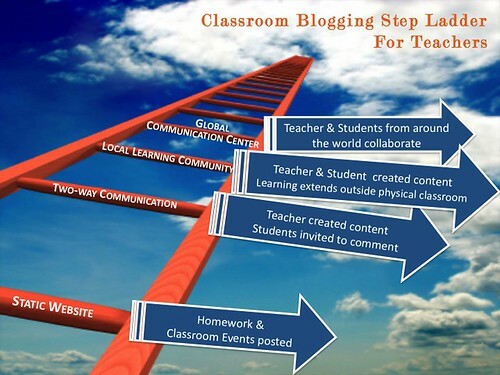 Here are some more ideas why you should be blogging with your students. Thinking & Blogging / Writing about Math... What Questions do I ask? How can I start blogging with my students? These videos use EasyBlog, but the concepts can be transferred to any blogging tool you choose to use. What do students blog about? Why don't 80% of teachers who create a class blog use it?